The magnificent Japanese Garden in Clingendael Park in The Hague can be visited only during a short period of the year, due to its fragility. 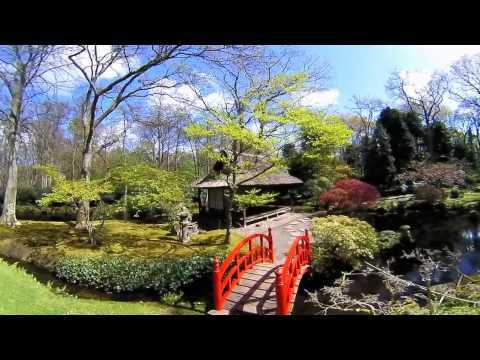 It's the only Japanese garden in the Netherlands from around 1910 and therefore has a high historical value. The Japanese Garden ('Japanse Tuin') was created in the beginning of the 20th century by the former owner of the country estate of Clingendael, Marguerite M. Baroness van Brienen (1871-1939), also called Lady Daisy. Lady Daisy sailed off a number of times by ship to Japan and brought back to the Netherlands a number of lanterns, a water cask, sculptures, the pavilion, the little bridges and several plants. The fascination for Japanese gardens in Europe and the U.S.A. developed when, after two centuries of almost total isolation, Japan opened its ports again around 1860. The Japanese style garden has evolved over several centuries, under influence of Japan's isolation, the native Shinto religion and Chinese culture and Buddhism. During her travels in Japan Lady Daisy has tried to grasp the unrivalled character and the aesthetic beauty of the gardens she visited. Back in the Netherlands she created her own interpretation of a Japanese style garden. The character of the garden in The Hague is very unique, augmented by the layers of moss. There are many lanterns, in a variety of shapes, to be admired at the Japanese Garden. Several lanterns have an image of Buddha. There are also lanterns with a deer, a holy animal in Japan. The garden also contains a turtle island and a crane-shaped stone setting. The turtle and the crane are both symbolic of a long life. In the back of the garden is a small statue of the Buddhist saint Jizo, patron of children and travellers. The garden also contains a small shrine with a sculpture of Jizo. The two water basins, one with the four Buddha's, the other in the shape of a lotus flower, are also interesting artefacts. The Municipality of The Hague has always taken great care of the Japanese Garden because of its uniqueness and tremendous historical value. The garden was placed on the list of national historical monuments in 2001. Wedding photos can be taken all year long in Clingendael Park. However, wedding photos can be taken in the Japanese Garden only when the garden is open to the public. The Clingendael estate can be reached by car via the van Alkemadelaan and the Wassenaarseweg. Under no circumstance can cars be parked on the Clingendael estate. Bus lines 18 and 23 also provide a means to reach Clingendael. The Clingendael Estate is open all year round. The Japanese Garden can be visited only during a short period during Spring and Autumn.